When you add text to a drawing, it uses the current text style, which determines the font, size, angle, orientation and other properties of the new text entity. Every drawing has a default text style, named Standard , which initially uses the Arial font. You cannot delete or rename the Standard style, but you can modify it. If you change the font or orientation of an existing style, all existing text entities created using that style are automatically updated to reflect the change. Changing any other property has no effect on existing text. You can create and use an unlimited number of additional text styles. Annotative text styles create annotative text entities. In an annotative text style the Height defines the paper space height of the text; the model space height depends on the current annotation scale as defined by the CANNOSCALE and CANNOSCALEVALUE system variables. Double click the Style field in the Status Bar. Type style in the command bar and press Enter. The Drawing Explorer - Text Styles dialog opens. Open the Text Style Explorer dialog. Click the New tool button ( ) in the Details section of the Drawing Explorer dialog. Select an existing style, then right click and choose New in the context menu. A NewStyle text style is created, inheriting the properties of the currently selected style. 3. Type a name in the Text Style Name field, replacing the NewStyle default name. 4. Define the text style properties. 5. Close the Text Style Explorer dialog. Define the text style properties. Close the Text Style Explorer dialog. When in Detail view ( ), click the blank tile in front of the text style name. A blue filled circle indicates the text style is set current. When in Detail view ( ) or Icon view ( ), right click then choose Set current in the context menu. Alternatively you can right click the Text style field in the Status Bar, then choose the new current style. The current style is marked in the style list. When you use the Style option in the create text procedures, the selected style will become the current text style. Click the Delete tool button ( ) in the Details section of the Drawing Explorer dialog. Right click, then choose Delete in the context menu. 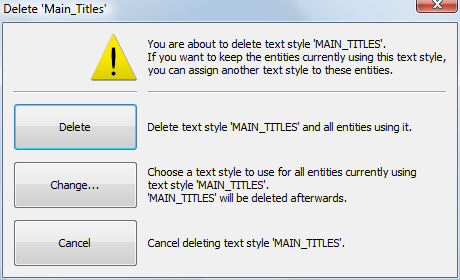 Click the Delete button to delete the text style and all entities using it. Click the Change... button to delete the text style and assign a different text style to the entities, which currently use the selected style. Click the Cancel button to cancel the delete procedure. It is not possible to delete the current text style.